Have you ever had a dog who was so ridiculously excited to see you (or someone else) when you walked in the door that she peed? Just walk in the door, look at your dog, and suddenly there’s a pile of pee you must clean up as soon as you get home. And, so many other dog lovers have had this experience. I had several clients who would pee every time their owners would walk in the door. They would just be that excited. They couldn’t wait for their best friend to walk through that door each day. Don’t panic if your dog is one of those who pees when excited. We’ll talk about why this is and the steps you can take to get this behavior under control. Excitement urination (peeing when excited) usually happens during a greeting or playtime of some sort. If your dog is peeing due to excitement, you won’t see any signs of submissive body language. She shouldn’t be looking at you with the ‘whale eye,’ a hunched back, tail between her legs, or display any other sign of submission. Instead, your dog will be acting completely normal… other than being thrilled about the situation of course. She won’t act scared, nervous, or frustrated. She will just be happy. That’s all. And, while we’re on this subject, it’s nothing you should be scolding her for. Excitement urination most commonly occurs in young dogs and puppies who don’t quite have control of their bladders. Don’t worry, most dogs get rid of this behavior with time (after one year of age). In some cases, this behavior continues due to allowing it to be reinforced. 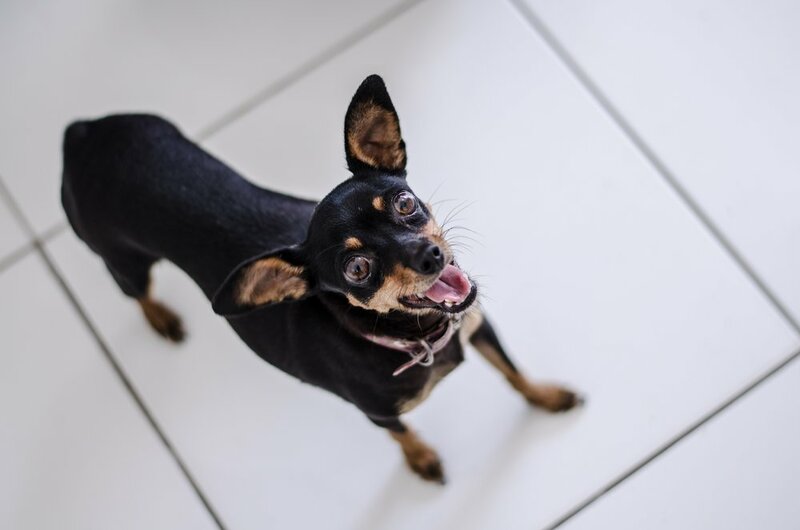 For example, if you pet and talk to your dog in an excited manner while she’s excitement peeing, you’ll be letting her know all is well and be somewhat encouraging the behavior. First and foremost, as I always say, it’s important to visit your veterinarian. The behaviorist is step two in the process. It’s important to see your vet first so he or she can rule out any medical reasons for the behavior. To avoid accidents, greeting or playing outdoors is recommended until the problem has been resolved. Take walks often. Take long walks. Take short walks. Vary your routine. Make sure that bladder is empty as often as possible. When your dog pees on walks, don’t forget to give praise and/or treats. Show him he’s doing a good job and you’re proud of him. He loves that. And, you’ll be making him more confident, too. Keep your greeting on the ‘down-low.’ Don’t get overly excited or talk in an excited voice when you arrive home. You shouldn’t have any high-pitched ‘baby talk,’ hand-clapping, or hugging when you see your dog after you get done running errands. It doesn’t sound quite fair, but it’s important for your dog’s behavioral well-being (and for your sanity so you’re not cleaning up puddles all the time). Once your dog calms down from the excitement of seeing you home, that’s when you can approach her and show her some love. The last point, and the most important point, is not to punish your dog. Yes, I know I said this earlier in the article. But, it’s extremely important. And, I want you to know that punishment, even if you believe it works will damage the relationship you share with your dog. Your dog will have less trust in you. Your bond will be broken. And, that’s something you may never get back. Young puppies have an extremely hard time holding their bladder and will need to relieve themselves frequently. Potty training isn’t an easy process, but with time and dedication, you’ll have a much easier time as your pup gets older. Being required to go potty in a designated area is new to any dog. A dog’s instincts don’t tell them they’re not permitted to use the bathroom inside the house. Their instincts tell them to find an area where they don’t sleep or eat, and use the bathroom there, whether inside or outside. That’s why it’s so important to praise your dog excessively when he uses the potty outside. Your dog needs your feedback to be successful in potty training (and all other types of training). Be sure to praise your puppy immediately after they potty outside… or else they won’t know what you’re praising them for. The praise can be in the form of an excited “yay, good job,” a yummy low-calorie treat or kibble, or both. Many dog lovers carry around a handful of kibble in their pockets out of their puppy’s daily portions. There’s controversy in the dog world about using crates… some dog lovers want a crate and others feel it’s not necessary. But, the crate essentially becomes your dog’s ‘den’ or ‘safe space.’ The crate is also helpful because puppies don’t like to use the bathroom where they sleep. The crate should have a soft layer of padding to it. A dog bed generally works just fine. The crate should be large enough for your puppy to stand up and move around, but not large enough for your pup to relieve himself and move to another spot to sleep. You can also place toys in the crate with your puppy so they’re able to play if they get bored. Mental puzzle toys, and some type of chew toy, are usually best. The Kong toys work extremely well, they’re mentally stimulating, and puppies generally can’trip them to shreds. One of the biggest mistakes puppy parents make is grabbing a toy that looks neat, but their puppy shreds the toy into small pieces and end up swallowing parts of the toy. This could lead to a blockage… and we don’t want that to happen. For this step, it’s critical to note that puppies should not stay in their crates for long periods of time. The crate should only be utilized when you’re not able to pay attention to your puppy. Then, once their potty trained, you can leave the door to their crate open so they’re able to freely enter and exit. Punishing your puppy for urinating or defecating on the floor can do more harm than good. By the time you find out your puppy has had an accident, your pup likely doesn’t remember what they did. And, even if you catch them in the act, punishing your puppy could permanently damage the bond and trust they have with you. Staying calm when they have an accident is essential. You shouldn’t yell, chase, or smack your puppy. You also shouldn’t ‘rub his nose in it.’ Not only will you lose their trust, but they will associate going potty with punishment and may resort to using the bathroom in areas you won’t find. Some dog lovers will argue, ‘but rubbing her nose in it works.’ And, yes… sometimes it does. But, you risk the bond you will have with her for the rest of her life by using punishment as a learning method. If you catch your puppy in the act, instead of punishing, try to re-direct her attention. You can re-direct her attention by saying “let’s go potty outside” or something similar. Then, immediately bring her outside to show her where it’s okay to use the bathroom. Then, once she uses the bathroom in your designed area, that’s when you can excessively praise her. She will connect the dots, and learn you are happy when she uses the bathroom in that particular area. You can, and should, have puppy pads in the house while you’re training your pup. But, you shouldn’t set them up in multiple areas around the house. This is confusing to a puppy, and they won’t understand why it’s not okay to use the bathroom in the house. They also may not be able to distinguish between a puppy pad and an area rug, or why she’s allowed to use the bathroom in some areas of the home but not others. Establishing a routine with any puppy or adult dog is critical. Dogs have a great sense of time, and if you have a set routine it will make potty training much easier. For example, if you always take her potty after she eats, she will understand after she eats she goes potty outside. This may take time- so don’t get upset if she doesn’t immediately understand the routine. Don’t worry- she will. The most important step you should be aware of in this process is to always be positive with your puppy. Dogs and puppies are eager to please you. They want to make you happy as often as possible. Also, understand every dog is different, and some puppies may take longer than others to learn what’s expected of them.